Postcards from Japan, China, India, and others. 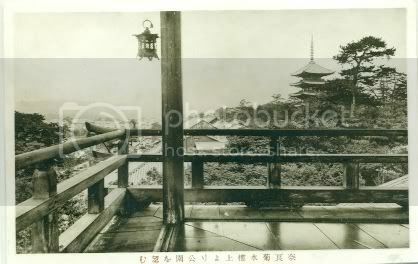 View from balcony of Japanese hotel ca1930s. Never used. Colombo Harbour, Ceylon. (Sri Lanka now). Divided back. Posted 1909. Some wear. Imperial Palace Japan. Real Photo postcard sent home by someone stationed there in 1945. Kyoto Hotel, Japan. 1930s. Sepia litho. Divided back, never used. Native Ziarat. People of the capital district in northern Pakistan and also refers to Muslim pilgrims. Black and white print publ. RW Rai & Sons. Posted 1925. Quetta, Bazaar. Northern Pakistan. Publ. by RW Rai & Sons. Posted 1926. Turkey. Constantinople and Sahara desert camels. Divided back; never used. $7.00. Royal Bombay Yacht Club. Publ. with a divided back, by GBV Ghoni. Posted to Canada. Stamp and cancel removed, some creases. ca1907. Matsumoto Castle, Japan. Real Photo Postcard published 1945. Posted 1946. Quetta's fruit market. Pakistan. Publ. by RAI Quetta. Divided back. Posted 1908. Ancient Ninevah, Iraq. Black and white postcard publ. by Shell Oil. Posted 1968. Stamp removed. Fujiya Hotel, Sun parlour. Miyanoshita, Japan. Divided back. Used but not posted, 1937. View on a Ceylon Tea Estate. Lipton's Series, publ. by the Photochrom Co. Divided back. Posted 1910. Israel, Jerusalem, publ with a divided back by The Christian Herald. Never used. ca1910. New Zealand. Real Photo Postcard of the warm-water falls, Wairakei (geothermal area on the North Island). Card is pre-1920. Israel, Bethlehem. Publ. by The Christian Herald. Never used. ca1910. New Zealand, Sutherland Falls. Publ. by Sempco Series. Divided back. Embossed print, white border. Used 1913 but never posted. Wesley Church, Penang, Malaysia. Real Photo Postcard publ. by The Federal Rubber Stamp Co. Divided back. Never used. 1940s-1950s. Lakeside view, Ceylon (now Sri Lanka). Published by Plâté. Divided back. Never used. Tamil lady in Ricksha, Colombo, Ceylon. Divided back. Publ. by Plate Ltd., Ceylon. Never posted. Hand painted image of Fujiyama or mt. Fuji, Japan. Japan's tallest mountain is actually a volcano, last active in 1700s. Divided back. Used but not posted. ca1920. Mount Everest as seen from Tiger Hill. From a photo by J. Burlington Smith, Darjeeling. Divided back. Never used. The D-H (Darjeeling-Himalayan Railway) Single Loop. From a photo by J. Burlington Smith, Darjeeling. Divided back. Never used.